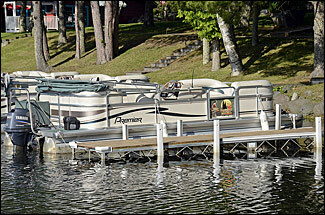 Most peak season (summer and fall) cabin rentals include a 21-foot pontoon with a 60 HP motor. Some private vacation home rentals managed by Grand Pines in other locations on Round Lake do not include a pontoon with rental. Pontoons have a full tank of gas when they are picked up and must be returned that way or a $50 service fee will be charged in addition to the cost of the gas. The only place on the lake to purchase gas is at the Round Lake Marina (see location on our property map). We provide life vests, anchors and other necessary equipment, as required by the DNR. The pontoons do not have radios, depth finders or fish finders. Each pontoon has at least 8 adult-size life vests on board, and we have various children’s sizes available at the Resort Office. We recommend providing your own infant-size life vests. Depending on the water level of the lakes, the pontoons may NOT be able to navigate under the bridge that connects Big and Little Round Lakes. 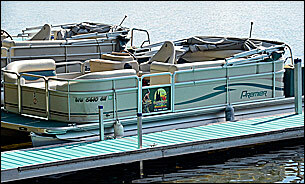 During the Off-Peak Season, pontoons are NOT included with cabin rental rates. 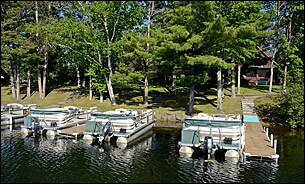 Guests may bring their own boat of any size, at no additional charge, and dock it at their cabin. There is one dock for the motel guests to share. The docks do not have electric access, but all cabins have exterior outlets. We recommend that you plan to bring a 100-foot extension cord to reach from your cabin to the dock. There is not a boat launch on our property. Round Lake Marina is the nearest public launch, but they do charge a fee for entering and exiting the lake.